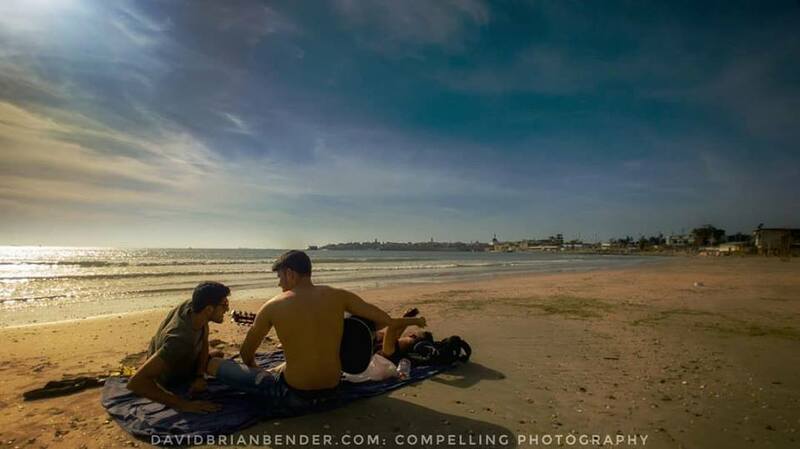 Israel has world-renowned beaches open all year around but there is something amazing about the summer months. The sun shines; the water sparkles. During the long, hot summer, hundreds of thousands of people visit the shorelines of Israel. Young people hang out there; old people walk slowly as the sunsets. Lovers smile and capture the lovely places where sand meets sea. For such a small country, it is amazing that we have four different shores. Israel’s Mediterranean beaches offer the most amazing sunsets. Around the beaches of the Sea of Galilee, there is year-round camping areas and gentle waves. The Dead Sea is where people go to soak in the minerals and float on the gently swaying water. And then there is Eilat, Israeli’s southern most city, offers a sparkling sea, coral reefs for snorkeling, and days of sunshine and fun. This is a beautiful photo, taken by Dave Bender – an amazing photographer. For sure, it is well known in Israel that while other young men are hanging out at the beaches, drinking, cruising around with girls, our young men are patrolling our borders. Always, they wear the uniform with pride, but it costs them…years of their lives, the weight of responsibility heavy on their shoulders from a young age. This picture is so special because it reminds us that they do get some (less than others but still some) of these special moments. Camping, sitting on the beach. For many, responsibility is just hours away. Today, they will sit on the beach, browse the internet with their phones, and play the guitar. Tomorrow, or perhaps even sooner, they will be back in uniform, back on our borders. But today, glorious today, they are free. They enter the army more boys than men. In three short years, they surrender most of the remaining traces of the boy. With dedication, the uniform and the gun are their companions through these years except for days like this one, captured by a talented photographer. Thank you, Dave – for the reminder…that the men who guard our borders, are sometimes the boys of summer.